How Birmingham can attract and retain the best young professionals – rather than them finding themselves in the city by accident – is set to be the subject of a major new study. The Future Commission, which is the brainchild of 2011 Birmingham Young Professional of the Year Hilary Allen, will be chaired by Pro Chancellor of the University of Warwick Sir George Cox and over the next six months will investigate what Birmingham needs to do to become the destination of choice for the cream of available talent. 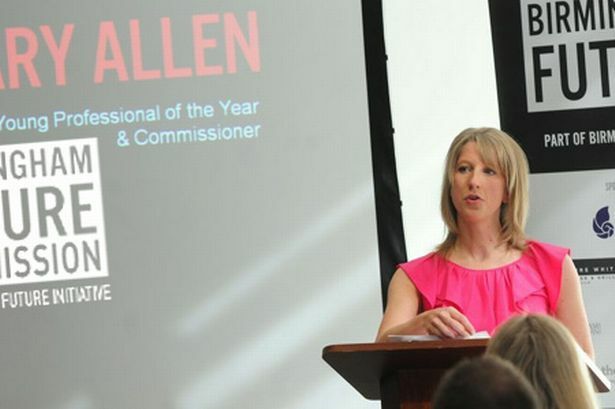 Ms Allen said the inspiration came from the fact that many senior members of Birmingham Future – the junior arm of Birmingham Forward and organisers of BYPY – had never intended to end up in the second city. “We had a sense at Birmingham Future that we don’t get enough people here,” she said. “I came here by accident as did chair Gareth Morgan and as did others, in fact if you look around the leadership table you see that many of us have arrived in the city by accident. Ms Allen said the commission was also about the evolution of Birmingham Future itself. “We don’t want to just be a networking organisation but actually shaping policy and this is a significant step towards that,” she said. The commission – which is being predominantly funded in cash and in kind by Warwick Business School, Colmore Business Improvement District, Pertemps, Aecom and the Metropolitan College and its Enterprise Academy – will be made up of eight people from a range of backgrounds including Sir George and Ms Allen. Other members will include Kay Greenbank from the Gambling Commission, Adam Henderson from JLR, Colin Corrodus from Deutsche Bank, the Bishop of Birmingham, the Rt Rev David Urquhart, Rashik Parmer from IBM Smarter Cities and Anisa Haghdadi, a business graduate of Aston Business School and winner of a Shaping Lives Award. Sir George Cox described the commission members as “diverse” and said it was important that the process was not too prescriptive so that the study could follow its own path. He said: “First we are gathering evidence and doing research and then that shapes how we take it beyond that – one never knows where it will lead and that’s the exciting part of it. “I think it’s a very good group. It’s very diverse and they are passionate people who want to do something and make a difference.